On behalf of the gluten free community at large I feel that I must say…REALLY? REALLY FDA? REALLY EPA? REALLY Organic food producers. So in case you haven’t heard, they have published a new study essentially saying that some brown rice, brown rice syrup and any products containing these things have unsafe levels of arsenic. So if you are out of the loop, check out this story on Arsenic-Organics-Rice from ABC. Historically, I hear a story like this and think “Eh, something is going to get me anyway. ” Salt, Eggs, Plastic. Most recently, wheat. What is the number one substitute for wheat? You guessed it…rice. Most recently in fact, I switched from using white rice flour to brown rice flour in an effort to BE HEALTHIER. Turns out that was perhaps not a great choice. So here I sit wondering what actually IS safe for me to eat? Should I even be all that worried for myself at this point? Might I end up looking like the kids from Flowers in the Attic? I don’t really know the answers to any of these questions but I do know this: These kinds of studies just re-energize my commitment to eating whole, local and fresh foods. As for everything else it really is kind of a crap shoot. That is not to say I am going to run right out and by some rice formula for a baby, but for myself, I am quite certain that a bagel made of rice flour will still pass these lips and I am not about to alter the best gluten free baking mix ever for my sweet baked treats. I will do some more in-depth research, but so far, the brown rice I buy, Bob’s Red Mill, has not been implicated in the arsenic explosion. So at the end of the day, the lesson learned here is one we try to live by: Know what you eat and where it comes from. Followed closely by: Something is going to get me. I am happy to be informed and hope we continue to get this level of transparency when it comes to our food source, but am not going to sound the alarms and change my whole life. Any other gfree folks or avid rice eaters? Please share your thoughts or suggestions. Happy Eating, Shopping and Ingredient reading. So we ring in 2012 and yet again here I sit with my “personal life coaches”, Oprah, Phil, Bob, Martha etc. And yes by “personal” I mean famous and influential people who I am slightly infatuated with, who through their writings, TV Shows and Websites I find motivation for change and tools to unlock my inner passion and yadayada, become a whole new, transformed “best self”. Generally speaking, I begin the New Year the same way every year and by about February 1st, lose most of my steam and my “best self” suddenly becomes a vision for the next year, when I might finally find more time for, well, besting myself as it were. Yet this year I begin with a new sense of direction and motivation. Thanks to some much-needed vacation time spent primarily in jammies with a warm cup of coffee or cold cup of wine depending on the time of day, I was able to really re-evaluate my long-term goals and become re-inspired to pursue my dream of farming,homesteading, writing, cooking and creating as a full-time job. I also learned, thanks to a handy quiz in the November issue of O (yup that sure is Oprah’s Magazine and no I was not exaggerating about my infatuation) that I need to be influential and a leader. For those of you who know me best this should not come as a surprise as I thrive on being the center of attention. After years of denial, I feel that I can finally say that with pride instead of pretending that it’s not true but then attempt to steal the spotlight just the same. So that being said, I will also be some kind of lobbyist or political personality striving to influence how our nation thinks about its food sources. Since magazine quizzes will NEVER steer you wrong, and because when I really do imagine that future it feels good and seems to fit, I think I will roll with it as the long-term goal that will help influence all the short-term, but long-lasting goals I will set for 2012. And so here I sit with my Iphone Resolution App (yes, they even make an app for that full of fun little icons, reminders and motivational gems of wisdom), a list of New Year’s Resolutions, advice filled writings by my aforementioned “mentors”, and a new-found commitment to making a change. There are of course the usual suspects: Weight Loss (I will be doing a 30 day no white or refined stuff; Bread, Rice, Potatoes..etc, so that should make for some fun blog posts full of snark, sugar deprived, angry comments so stay tuned), Exercise More (maybe actually use that free gym membership I so wonderfully get from my employer), Blog Daily (also should lead to some fun posts), Get and Stay Organized (also an app for that, although did not actually organize my filing cabinet as I had hoped, just gave me tips on how to do so), Create and Stick to a Budget, and Get More Sleep (off to a great start tonight, what with the fine folks at the NFL and Broadcast TV scheduling the Giants/Cowboys playoff berth deciding game for 8 PM on a Sunday..to you I say thanks for screwing me and my resolution over). I also added Make Homemade Gifts, Go to Church/Be more Spiritual and my personal favorite: Pretend I am a Farmer in Real Life. Yes you read that right. This resolution is born of my sharing my renewed drive with my husband and friend (who shall be known as Nathan Negative and Johnny Dream-Crusher for any writing related to this resolution) who believe that I do not fully understand the reality of my dream. Apparently, since I don’t often (and by often I mean NEVER) clean the litter box or chicken coop and occasionally forget to put food in the dog’s dish, I will never make it as a farmer. I submit that I CAN do ALL of those things, so in 2012 I will do them, write them and perhaps even photograph them. So, tomorrow, I will wake up with Stevia in my coffee and a spring in my step as I get in that daily workout, focus and organize at my day job and come home to focus, organize and blog here. I think 2012 has a lot to offer and for the first time since the birth of our daughter (who by the way has her first REAL birthday in 2012 which is a Leap Year for those of you not in the know) completely turned our world upside down and all around in a super great, but slightly disheveled way, I feel like I have the energy and focus to complete anything I set my mind too. To all of you I say Happy New Year to all and to all A Good Night!!! 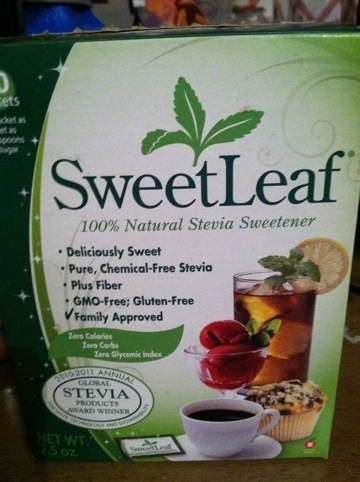 Ok so I bought stevia. I need an occasional sweetener that is not going to widen my hips. I am morally opposed to Aspartame and all of it’s cousins. So I found this at my local healthfood store and would love feedback from anyone who has tried it. I will always favor maple syrup and honey but tonight I tried some stevia in my apple cider vinegar drink ( a tale for a different day) and it was quite good and I don’t feel like I sucked on a test tube full of chemicals. Thoughts? It is hot. Stupid hot. I am quite certain that my brain is melting. In this kind of heat there is not much you can do but turn the sprinklers on and hope for the best. The lettuce might bolt and the peas will slow to a grinding halt. The tomatoes will ripen and the peppers well go gonzo. I will float in the pool and pick when I can. I will drink lots of water and wear lots of sunscreen. We will use the grill and hang out in the A/C. Take a break. The plants will be ok until the heatwave breaks. Stay Cool!!! 1. Wake up with alarm. It may or may not be dawn. Depends on the time of year. 2. Let dog out, brew coffee, take shower, dress child prepare lunches, breakfasts, etc. Turn on Disney Channel/Nick Jr. and pray for a meltdown free morning. 3. Rush off to office and punch in just under the wire. Work a full day. 4. Leave office. Make any and all last-minute stops. Funny how last-minute turns into last 20. Barely make it home/to daycare on time. 5. Get to house, find solace in an adult beverage. Try to come up with a nutritious tasty dinner that does not come from a box and takes only 20 minutes to make. Often experience big, fat failure. 6. Catch up on house work, MAYBE, watch a favorite tv show. pass out while trying to read your favorite book, wondering where the devil the day went. 7. Spend your weekends trying to cram an entire week’s worth of “home-work” in. Inform your family that if they would like to eat they need to pick up the phone or open a box of Cheerios. You are done. If this looks at all like a typical day for you, adding harvesting and preserving your vegetables may seem like the straw that will crack your spine. When I add things like jam, relish and pickle making and blanching and freezing pounds of greens and peas to an otherwise ridiculous day it seems physically impossible to do it all. When I tell friends that I stayed up until midnight making salsa, they look at me like the elevator stopped traveling to the top floor. I would be lying if I said the harvest was not time-consuming or did not mean burning the candle at both ends. There have been many a tear shed on a Tuesday night when the salsa was barely going into the jars at midnight, let alone being processed. I can tell you, however, that it is worth every tear-stained, pepper burned, sliced finger of it. If you are thinking about giving preserving the season a try with goods from your own garden, CSA share, or routine trips to your local farmstand/farmers market, here are some tips that will help you keep your sanity and enjoy your hard-earned goods. 1. Get a Foodsaver or one of the knock off’s. We have a Rival and it is amazing. I am not sure how I ever got by without it. Freezing raspberries this evening took 15 minutes and they look like they will last forever and taste good too. Preserving the season is done in vain if your frozen goods taste like yucky ice. 2. Make something you have never made before. With part of our raspberry harvest this year I made GF raspberry cupcakes with raspberry buttercream frosting. This is not some thing I would normally make, but I was inspired by the fruit and my family loved them because they tasted like summer in a cupcake. It did not seem like hard harvest work when I was licking the frosting. off my nose, and my fingers, and my lips. 3. A blanch a day keeps the doctor away. If you can blanch and freeze one set of veggies either from garden or CSA a day, you will have a freezer packed with fresh and delicious vegetables in no time. 4. There is always room for more kale. Or swiss chard. Or beet greens. If you get a lot of greens (there is more in this world than spinach), you can add them to pretty much every casserole, make a great bed for poached eggs or make a yummy addition to a salad or a sandwich. Kale chips are an amazing snack that is super easy to make. 5. Do what you want. If you don’t like salsa, don’t make salsa. If you really hate Kale, give it to a friend or donate it to a food pantry. Preserving the harvest is about wanting to enjoy the taste and health benefits of the growing season. If you don’t like it now, you will not like in weeks or months. If you don’t love making jams, jellies, relishes and preserves don’t do it. 6. If you take the time to freeze..take the the time to blanch. Blanching your vegetables is key to keeping them fresh and tasty by killing enzymes. Over-blanching kicks them into high gear. Under does not completely destroy them. Take a peek at the Ball Book or the Better Homes and Garden cookbook. Both places give you a detailed charts on how long to boil and when to throw them into the ice-water. It takes time and can be hot, but is worth every minute. 7. A food processor/grinder is a must have. It can take hours to chop by hand and it doesn’t make it taste better. It just makes you angry and no one will give you a medal for it, because no-one cares. In the end, it is a lot of work. and it can take a lot of time, as clearly evidences by the 6 days it has taken me to write this. Women 100 years ago did not have all the conveniences we have now, but did not have all the same stresses or time consumers we have now. In the end however, when you are craving a homemade blueberry muffin or a reuben with homemade thousand island dressing there is nothing like finding and tasting delicious items from your own stores. The best advice I can give: Try it. If you don’t love it, let someone else do it for you. If you do, keep trying new and fun things with new and fun vegetables. I promise your palette and your health will thank you. I was hoping to have some sumptuous photos of some of the delicious things that harvest season has brought to our kitchen, however, I am having some photo difficulties. Stay tuned for some specific recipes and photos. You are probably wondering what on earth golfing has to do with homesteading and/or organic gardening, right? I will be honest, not a whole heck of a lot. However, I absolutely believe to be successful as a homesteader, you have to be willing to try new things. Since I am what some psychologist types would like to call a “joiner”, I did not even blink when someone asked me to play in a charity golf tournament. I simply said, “sure I’d love to!” The fact that I hadn’t touched a club in almost 5 years and never really played a full game didn’t matter until the next day, when the reality of what I had committed to sank in. So today, I “tried” golfing again and I was terrible. No, terrible is to kind. HORRIBLE. My teammates should have gotten tee-shirts that say, “I played golf with Jamie and all I got was this damn T-shirt?” Thankfully, they were all super kind and supportive and were happy to have some comic relief. As it turns out I am looking forward to playing again!! I was a little disheartened by my 20th swing and a miss and by around hole 9, I was ready to throw in the towel. Instead, I ordered a drink, watched my teammates, and tried again. Now granted, there is a tree here in northern VT with a little less bark, a pond with a few extra golf balls at the bottom, and one outbuilding with a little dent in it, but by the 18th hole, I was actually making solid contact and putting the ball in the air. All the while, I was laughing and enjoying my time in the great outdoors with great people. My journey into homesteading has been a similar experience. Our first garden lacked, well, vegetables. The first batch of canned jam I ever made was not among my top 100 tastiest concoctions. It has taken me 7 years to perfect pie crust. The first thing I ever knitted was a blanket for my friend’s wedding. They have been married nearly 5 years and it is STILL not done. The first diaper I put on my child was backwards. You get the drift. Every single one of those things has an amazing memory or funny story attached to it. So many of the best experiences of my life have come from deciding I wanted to learn a skill or “join” a club. I cannot wait to see what fun new skills my journey towards becoming the a little mom on the prairie bring my way. Getting back to basics means learning a lot of new things, which means inevitable failure before amazing success. I hope everyone tries something for the first time, falls flat on their face, comes back for a second whack at it and repeats the process for the rest of their lives. On a side note : Should you see me on the course, stay away from buildings and trees for your own safety. Tonight’s post is a little lean because as it turns out this modern-day homesteader has some modern-day homework to wrap up. Today, however, was one of those days that was just to wonderful to not write about. It wasn’t wonderful in a wedding, birth of my child, day on the beach kind of wonderful, but a simple pleasures life is good kind. Today was a day to enjoy ice cream sundaes with friends and co-workers. It was about eating a homemade corn fritter filled with fresh herbs that tantalized the taste buds. It was about going for an amazing walk in the sunshine with a good friend. It was about a kind and patient man who I happen to adore helping me master a golf swing. It was about talking to chickens and having them talk back. It was about running through the sprinkler with my daughter and watching as seeds start to sprout in our garden. It was about eating grilled cheese and letting the magic of dance fill our home. It is days like these that remind me that the root of all our homesteading goals and practices is to relish these simple times and make them a rule not the exception. Days like this also remind me that talking to chickens is a little weird and even when you think you are a terrible golfer, the magic shot will happen when you are aiming towards the house. Sleep tight and strive for a 100 simple pleasures tomorrow! !